Chris Dippolito has been active in the Philadelphia music scene since 2002 when he formed the progressive jazz group, "Agent Moosehead". Since that time he has performed extensively with the band (often times utilizing musicians from the forefront of the city's rich jazz community) including live shows at venues and clubs in Philadelphia, New York, and the surrounding areas, writing and performing live re-scores to films, and recording two studio albums. He has also been involved in various side projects and ensembles over the last ten years as well as stints ascomposer / arranger for St. Joseph's University Jazz Band and music director / arranger for the hip hop artist Julian Jones. Chris's training came in the form of Private study with Peter Marino and theory and composition study with Dr. Loyda Camacho. He began teaching in 2004 at the age of 23 and started his tenure at Music and Arts four years later. 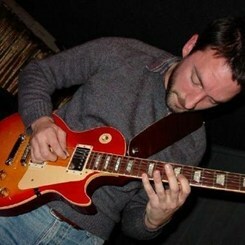 Chris is proficient in instruction on guitar and bass in all styles and genres focusing on mechanics, technique, theory, and music appreciation without neglecting a student's individual personal interests and goals from introductory to advanced levels. In addition to lessons on instrument performance, Chris is comfortable teaching composition and song writing and tries to put students in live ensemble performance situations through in-store recitals with the intention of providing players the experience of interacting with other musicians socially and productively to achieve a common musical goal. Request Lessons with Christopher today!